Last month, Rainer Schimpf, 51, was snorkeling off the coast of Port Elizabeth, South Africa. As a dive operator, he was observing and documenting a sardine run, when suddenly he found himself in the path of a Bryde’s Whale. The whale grabbed him with his mouth and scarfed him up head first. The story almost sounds like fake news, but it really happened. Some church leaders respond to a similar account found in the Bible with doubt and unbelief – the story of Jonah. Nevertheless, the story is historical. It actually happened. Jonah, the Bible says, was going to Tarshish on a ship, which was sailing in the opposite direction of Ninevah, the place God had instructed him to go and preach a message of repentance. 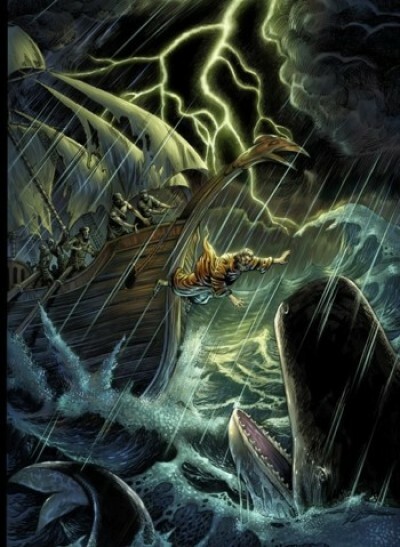 God overruled Jonah’s disobedience by making a great storm to arise. To save the ship, the sailors cast Jonah out and into the sea. If that wasn’t bad enough, Jonah was then swallowed by a great fish, presumably a whale, only to later be spit out on the shore near Nineveh, where he was supposed to deliver God’s message. Jonah would then obey God’s call, and the city was saved from God’s judgment. Two preachers, a theological conservative and a theological liberal, were arguing about this account in Scripture. “Do you mean to tell me that you really believe that story about Jonah being swallowed by a whale?” the liberal preacher asked the other. This jest was not meant as an insult. Nor was it meant to imply that everyone who doesn’t believe in a literal account of Jonah will be barred from heaven. Nevertheless, it must be said that taking an approach to Scripture that denies its inerrancy or infallibility will result in the most undesirable of spiritual and moral consequences. Progressive mainline churches gave up on the inerrancy of the Bible decades ago, and the outcome has been horrific for Christian orthodoxy. Today, it can be seen in many of their most erroneous views about God and his sovereignty, Jesus and the purpose for which he came, evolution, abortion, human sexuality, gender, social justice, wealth redistribution, income equality, and socialistic principles. Moreover, forsaking belief in the full authority of the Bible has had a devastating effect on the nation’s faith in general. Two years ago, Gallup did a poll that showed fewer than one in four Americans (25%) now hold that the Bible is “the actual Word of God, and is to be taken literally, word for word.” Approximately 26% view the Bible as a “book of fables, legends, history and moral precepts recorded by man.” Gallup said this was the first time in their “four-decade trend that biblical literalism has not surpassed biblical skepticism.” It’s only logical that if the church demonstrates a lack of faith in God’s Word, the world will out-pace it in following suit. If the inspiration of the Scriptures does not pertain to the totality of its content, then it means something outside of the Bible ultimately becomes its Judge – a non-inspired source becomes the authority of an inspired one. Life, and its many issues are no longer measured by a sure and trusted plumb line, but by one not necessarily any more authoritative than another. Thus, there is no absolute truth. Everything simply becomes a matter of conflicting value systems endlessly seeking to prevail over each other – a recipe not for freedom, truth, justice, love, peace, and tolerance but endless chaos, confusion, and calamities. And unfortunately, that leaves us in a whale of a mess.